Now, Molly’s future can follow two very different paths: one where she stays with her baby’s father, despite her misgivings and his family’s unreasonable expectations, and one where she ventures out on her own as a single mother, embracing all the hardships that come with it. I received a copy of ALL THE DIFFERENCE by Leah Ferguson and didn't really give it much thought. (Isn't that horrible to say?) The cover was cute enough but I placed the book on my shelves and thought that I might get around to it sometime. And then lo and behold... I read that the author lives in Mechanicsburg, PA -- the same small town that where I live; and I decided to read this book right away! Needless to say, there aren't many published authors hanging out in Central PA! ALL THE DIFFERENCE is a very original and cute story. It begins on New Year's Eve when Molly Sullivan, a 30 year old single woman who works at a PR firm, discovers that she's pregnant. Molly always knew she wanted to be a mom, but she's not sure that the timing is quite right. She lives with her boyfriend, who is seemingly perfect -- rich and handsome; however, when he unexpectedly proposes at the New Year's Eve party in front of all of their friends, Molly finds that she is at a loss for words. She thought she'd be happy when he proposed, especially in light of the pregnancy, but she isn't sure that saying "I Do" is the right thing for her. Molly has two choices. She can either say "yes" or "no," right? And interestingly enough, Ms. Ferguson decides to explore both options in ALL THE DIFFERENCE. In alternating chapters, the reader gets to see Molly's life and what happens if she accepts his proposal or decides to break up with him. It's a unique novel about life's choices and the after effects, and I thought the author did a great job by featuring both sides... and effectively using her back and forth storytelling method to progress the story. One thing I definitely liked about this story was Molly. She was a great character and much more complex than I was expecting. Even though her boyfriend was a bit of a cad and quite shallow (almost one-dimensional), I thought Molly was a complicated and well developed character. She was definitely at a cross-roads in her life, both personally and professionally; and she had both internal pressure and external pressure (i.e. from her family) to do the "right" thing. I also liked that this book allowed the reader to see the positives and negatives for both of Molly's choices. Every complicated life decision that we make has good things and not-so-good things about it. ALL THE DIFFERENCE really showcases the difficult choices and the repercussions from them. I don't want to give too much away about this novel, but sometimes the most difficult choices are the best ones for everyone involved. And finally, I appreciated many of the messages in this story. I've already mentioned the life lessons about making difficult choices, but ALL THE DIFFERENCE also showed the importance of family and friends in our lives. In addition, it also demonstrated the importance of staying true to one's self and empowerment. ALL THE DIFFERENCE would make a fun book club selection. There is a reading guide with eleven questions in the back of the book; however, I couldn't find an on-line link. Some of the themes you might want to discuss include choices, hindsight, sacrifice, career, family, friendship, selfishness, control, stress, second chances, infertility, and motherhood. 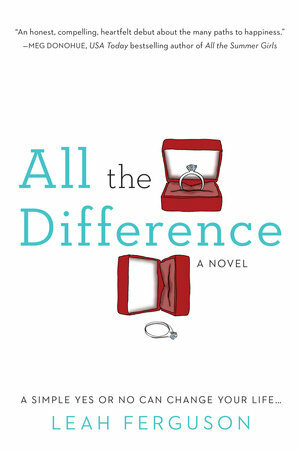 I thought ALL THE DIFFERENCE was an original and fun book that was also thought-provoking. Recommended to fans of women's fiction! This sounds fun and thought provoking too. I like the sound of this one. I recently read another book that had sort of a similar way of telling the story - Maybe In Another Life - which I liked very much. Thanks for sharing about this one! This books sounds so good! Kinda like the movie Sliding Doors. You should see if the author could come to your book club - that would be so cool! Oh, I like the premise of this. It wasn't on my list at all.